Draft: 2008, Arizona Diamondbacks, 2nd rd. Bryan Anthony Shaw … married to Kristen, they reside in Arizona during the offseason ... Enjoys video games and golf in his free time ... Graduated from Livermore High School in Livermore, Calif., the same high school as LHP Randy Johnson ... Earned two varsity letters in baseball and football and one in basketball ... Attended Long Beach State from 2006-08. Made 61 appearances in his first season with the Rockies, allowing career highs in runs (43), earned runs (36) and home runs (nine) ... Appeared in at least 60 games for the seventh consecutive season, but his 61 appearances were his fewest since his rookie season in 2011 (33 appearances with Arizona) ... Along with allowing career highs in runs, earned runs and home runs, tied his career high with 28 walks and six losses ... Went 3-5 with a 7.57 ERA (35.2 IP, 30 ER), eight home runs, 20 walks and 34 strikeouts in 41 appearances prior to being placed on the 10-day disabled list on June 24 with a right calf strain ... In 20 appearances after being reinstated from the DL on July 11, went 1-1 with a 2.84 ERA (19.0 IP, 6 ER), one home run, eight walks and 20 strikeouts ... Allowed a career-high six runs June 9 vs. Arizona … also allowed a career-high-tying five earned runs April 20 vs. Chicago-NL ... Made his 500th career appearance May 18 at San Francisco. Tied for the Major League lead with 79 relief appearances, his fifth straight season with at least 70 appearances ... 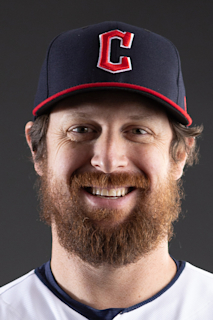 Finished the season with 378 career regular season relief appearances with the Cleveland Indians, the secondmost relief appearances in franchise history … became the only Indians pitcher to surpass the 70-game mark in five seasons in franchise history ... Among American League relievers, finished first in games, seventh in relief innings (76.2) and fourth in holds (26) … was tied for 13th among all American League pitchers with 18 double plays induced, the most among MLB relievers ... Set career highs in innings pitched (76.2) and saves (three) and tied his career high with 73 strikeouts ... Recorded his 400th appearance and the win in the Indians Home Opener, April 11 vs. Chicago-AL ... Allowed a run in 24 of 79 outings and did not allow an earned run in 59 of his appearances ... Limited opposing hitters to a .270 batting average (40-for-148) with runners on base, a .290 average (20-for-69) with runners in scoring position and a .161 average (9-for-56) when leading off an inning ... Held left-handed hitters to a .234 batting average and a .586 OPS ... Induced opposing left-handed batters to ground into seven double plays in 29 opportunities (24.1%), the highest percentage among 39 qualified relief pitchers in MLB ... In three postseason appearances, allowed one run in six innings pitched (1.50 ERA), with no walks and five strikeouts. Enjoyed another outstanding season in a set-up role, recording a relief ERA of 3.24 in 75 appearances, becoming the first Indians reliever in club history to amass at least 70 appearances in four seasons (Shaw and Mark Melancon only MLB pitchers with at least 70 outings each of those seasons since 2013)…His 9.3 strikeouts per 9.0 IP represented a career-best as he finished tied for 7th in the American League with a team-high 25 holds…His 75 appearances led A.L. relievers (2nd time) and his 66.2 relief innings were T19th-most in the league...Leads all Major League relief pitchers with 299 appearances over the last four seasons since 2013...Had a rough April for the second straight year (9.64 ERA, 10ER/9.1 IP) and went on to record an ERA of 2.09 from April 25 thru the end of the regular season (60.1IP, 45H, 14ER, 24BB, 60SO)…Allowed a career-high 5 runs (5ER) in 0.2IP on April 9 at Chicago-AL…Allowed runs in only 14 of 75 games and allowed 13 of his 24 earned runs on the season in just three outings (4/9, 4/16, 7/18; 13ER/2.0IP)…Over his remaining 72 outings he recorded an ERA of 1.53 (64.2IP, 11ER)...Enjoyed a 13-game scoreless stretch from June 17-July 16 (13.1IP, 4H, 16SO, .114 avg) and went on to post a career-high and Indians relief season-high 18-game scoreless stretch from July 19-August 31 (17.0IP, 10H, 0R, 6BB, 15SO), the longest consecutive scoreless streak of his career and the longest by an Indians pitcher in 2016…From June 17 thru the end of the season he recorded 39 of 45 scoreless outings and an ERA of 1.74 (41.1IP, 28H, 8ER, 19BB, 43SO, .194 avg)...Batters hit .198 (21-106) off him with runners on base (8th-lowest relief mark in the A.L.) and a .141 (9-64) average against with RISP (11th-lowest relief mark in the A.L. )…Batters hit .167 (14-84) off him when he was ahead in the count…ERA was 5.68 as late as June 14…Recorded only save of the season on August 31 vs. Minnesota (0.1IP)...Went a combined 2-1 with a 4.35 ERA in 11 relief appearances in the Postseason (10.1IP, 14H, 5ER, 5BB, 12SO). Had an another outstanding season in a set-up role, leading the team in appearances and holds for the second straight season...Finished 7th among American League relievers in holds (23) and tied for 2nd in games pitched (74)...Was also T20th in the A.L. with 64.0 relief innings pitched....He has appeared in the most games (224) in MLB since the start of 2013...After a rough spring and a 5.06 ERA (5.1IP, 10H, 3R/ER) over his first 10 regular season outings thru April 28 he posted an ERA of 2.76 (64 games, 58.2IP, 49H, 18ER, 17BB, 49SO) from April 30 thru the end of the season, equaling his single-game career-high of 4 strikeouts on April 30 vs. Toronto...From May 25 thru the end of the season he posted an ERA of 2.86 (53 games, 50.1IP, 43H, 16ER, 13BB, 42SO)...Recorded saves on June 18 vs. Chicago-NL and July 7 vs. Houston... Did not allow an earned run in 59 of his 74 appearances...17 of his 48 inherited runners scored on the season (35.4%) as batters hit .254 (29-for-114) with runners on base and .294 (20-for-68) with RISP...Left-handed batters hit just .226 (21-for-93, .673 OPS) off him in 2015 after they batted .294 (32-109, .776 OPS) in 2014... From August 17 thru the end of the season he recorded an ERA of 3.32 (24 games, 21.2IP, 22H, 8ER, 6BB, 19SO), recording scoreless outings in 19 of those. Had an outstanding season in a set-up role, becoming the first Indians reliever to lead the American League in appearances (career-high 80) since 1955 (Ray Narleski) and the club's first outright Major League leader in games pitched since Jim Bagby in 1920...His 80 appearances set the new club record for single-season relief games, breaking the 2005 mark of 79 set by Bobby Howry ... Also finished among American League relief leaders in holds (T-5th, 24), relief innings (T-4th, 76.1), first batter average against (6th, .139, 10/72), scoreless appearances (T-8th, 62) and relief wins (T-11th, 5). Worked on consecutive days 27 times in 2014 as the Indians were 52-28 (.663) in games he ap p eared in (0 ER allowed in 66 of 80 outings)... The only month he recorded an ERA over 4.10 was June, posting a 6.52 ERA (9.2IP , 12H, 7R/ER) in 10 outings ... ERA in April was 1.98 (14G , 13.1IP , 10H, 3E R) and then p osted a May ERA of 0.71 in 14 outings (12.2IP , 9H, 1E R) ... ERA from July 24 -end of season was 2.35 (32 G , 30.2IP , 21H, 9R/ 8E R, 24K ) and ERA from August 1-end of season was 1.98 (29 G , 27.1IP , 19H, 6E R, 23K )...Equaled a season/career-high with 2.1 IP on August 26 at Chicago-AL for the third time. Suffered a pair of blown saves at Detroit on Sept 13-14 (1.2IP , 4H, 4R/ ER, allowed a pair of 2-run homers in each) that took season ERA from 2.20 to 2.65...Did not allow a run over his last 5 outings after Sept. 17 (4.1IP , 2H, 0R) ... Limited right-handed batters to a .168 (29-173) average against with 39 strikeouts (.493 OPS) and averaged just 2.6 walks per 9.0IP for the season ... Batters hit .244 (29-119) off him with runners on base and .243 (17-70) with RISP. Off-season acquisition from Arizona was a very reliable member of the bullpen, versatile enough to get one big out and valuable in his ability to work multiple innings...Got better as the season went along as the games increased in importance, going 5-0 w/a save and a 0.00 ERA in 13 September outings (15.1IP, 8H, 0R, 2BB, 15K, .154avg)...Only MLB pitcher w/5 Sept wins...From July 6 thru the end of the season he recorded an ERA of 1.73 (36.1IP, 23H, 7ER) in 35 games (31 scoreless, .176 avg against)...52 of his 70 outings were scoreless as he worked at least 2.0 innings in nine of them...Struck out a career-high 4 batters twice (April 16 vs Boston/August 2 at Miami)...His 15.1IP consecutive scoreless innings from Sept 2-26 was the longest by an Indians reliever in 2013 (13 straight games equaled a season-high)...Finished tied for 7th in relief innings (75.0), T15th in games (70), tied for 2nd with 7 relief wins, T14th in the AL in inherited runners scoring pct (25%, 11 of 44) and 17th with a .201 (27-134) average against with men on base...Earned first AL save and first since April 15, 2012 at Colorado in rain-shortened 7.0-inning game of Sept 20 vs. Houston....Struggled over a six-week stretch from May 28-July 4, posting an ERA of 9.88 in 15 games (13.2IP, 17H, 15ER) that took his season ERA from 1.80 to 4.66...Right-handed hitters hit just .182 (27-148) off him with 49 strikeouts and batters hit .205 (16-78) when runners were in scoring position...Only one other Indians reliever since 1920 has won 5 games in a month (Frank Funk, 6 wins, May 1961)...3rd on the team with 12 holds...Batters hit .167 (19-114) when he was ahead in the count. Went 1-6 with 2 saves and a 3.49 ERA (23 ER in 59.1 IP) in 64 relief appearances in his second season with the D-backs...Registered a career-high 10 holds, 1 more than 2011...Posted a 2.11 ERA (5 ER in 21.1 IP) in 21 games after his recall from Triple-A Reno on August 11th, including 10 straight appearances without an earned run to end the season (10.1 IP). Was 1-2 with a 4.35 ERA (15 ER in 31.0 IP) in 34 games at Chase Field and 0-4 with a 2.54 ERA (8 ER in 28.1 IP) in 30 games on the road...Allowed just 5-of-28 (17.9 percent) inherited runners to score...Limited right-handed hitters to .211 average (23-for-109). Earned first career save on April 8 vs. Giants and 2nd save on April 15 at Colorado...His 0.79 ERA (1 ER in 11.1 IP) in June was seventh-best among NL relievers and fourth-best June ERA by a reliever in club history (min. 10 G)...Was 1-4 with a 4.26 ERA (18 ER in 38.0 IP) in 43 appearances before being optioned to Reno on July 22...Recalled on August 11 after posting a 2.25 ERA (2 ER in 8.0 IP) and 2 saves in 8 games with the Aces. Appeared in 33 games with the D-backs, going 1-0 with a 2.54 ERA (8 ER in 28.1 IP)...also combined to go 4-1 with a 2.58 ERA (11 ER in 38.1 IP) and 16 saves with Double-A Mobile and Triple-A Reno...His contract was selected from Reno on June 10 and made his Major League debut that night with 1.0 scoreless inning @ Marlins...Recorded his first career win on Aug. 16 @ Phillies...Posted a 1.72 ERA (3 ER in 15.2 IP) and 5 holds over his final 19 games...POSTSEASON: Appeared in all 4 NLDS games vs. Brewers and did not allow a hit or run (4.0 IP)...is 1 of 3 pitchers in DS history to make at least 4 hitless appearances (also the Braves' Jaret Wright in 2003 and Rockies Franklin Moralesin 2009). Spent the entire season with Mobile, going 4-9 with a 4.26 ERA (48 ER in 101.1 IP) and 2 saves in 33 games (13 starts)...Was 2-3 with a 3.19 ERA (11 ER in 31.0 IP) in relief and 2-6 with a 4.73 ERA (37 ER in 70.1 IP) as a starter...Pitched with Scottsdale of the Arizona Fall League. Made a career-high 19 starts for Single-A Advanced Visalia...Held opponents to a .236 batting average (96-for-236) as righties hit .212 (46-for-217) with 53 strikeouts and lefties batted .265 (50-for-189) with 41 strikeouts...In his first professional start, picked up his first career win on April 14 @ Rancho Cucamonga, allowing 1 run over 5.0 innings...Over 5 starts in June, posted a 2.42 ERA (7 ER in 26.0 IP) and .221 opponents average with 16 strikeouts...Struck out a career-high 8 batters on July 16 at Bakersfield...Did not allow a run in 3 games spanning 7.0 innings from Aug. 22-30 while fanning 9. Began his professional career at Rookie-Advanced Missoula...Earned his first career save on June 30 @ Helena with 2.0 scoreless, hitless innings...Had 4-strikeout games on July 8 vs. Casper and July 14 vs. Idaho Falls...Transferred to Single-A South Bend on July 25...Had a 4-strikeout outing on Aug. 24 @ Great Lakes...Did not allow an earned run in 3 straight outings from Aug. 24-31. July 11, 2018 Colorado Rockies activated RHP Bryan Shaw from the 10-day disabled list. July 6, 2018 Colorado Rockies sent RHP Bryan Shaw on a rehab assignment to Albuquerque Isotopes. June 24, 2018 Colorado Rockies placed RHP Bryan Shaw on the 10-day disabled list. Right calf strain. December 15, 2017 Colorado Rockies signed free agent RHP Bryan Shaw. November 2, 2017 RHP Bryan Shaw elected free agency. December 11, 2012 Cleveland Indians traded 1B Lars Anderson, SS Didi Gregorius, SS Didi Gregorius and LHP Tony Sipp to Arizona Diamondbacks for RHP Matt Albers, RHP Trevor Bauer and RHP Bryan Shaw. August 11, 2012 Arizona Diamondbacks recalled Bryan Shaw from Reno Aces. July 22, 2012 Arizona Diamondbacks optioned Bryan Shaw to Reno Aces. July 20, 2011 Arizona Diamondbacks recalled Bryan Shaw from Reno Aces. June 28, 2011 Arizona Diamondbacks optioned Bryan Shaw to Reno Aces. June 10, 2011 Arizona Diamondbacks selected the contract of Bryan Shaw from Reno Aces. May 23, 2011 Bryan Shaw assigned to Reno Aces from Mobile BayBears. March 30, 2011 Bryan Shaw assigned to Tigres de Quintana Roo. March 20, 2011 RHP Bryan Shaw assigned to Arizona Diamondbacks. August 31, 2010 Bryan Shaw assigned to Scottsdale Scorpions. April 5, 2010 Bryan Shaw assigned to Mobile BayBears from Visalia Rawhide. February 1, 2010 Arizona Diamondbacks invited non-roster RHP Bryan Shaw to spring training.